Graphics or video drivers play an important role in Windows operating system. Out-dated or incompatible graphics drivers are one of primary reasons for BSOD (Blue Screen of Death) errors. Although updating Graphics card driver, also known as video card or GPU driver, generally doesn’t improve the system speed, having most recent graphics or video driver will surely make graphics intensive jobs much faster. NVIDIA, AMD, and Intel graphics generally release updates to graphics drivers multiple times in a year. Although there are official tools available to automatically update graphics drivers, these graphics card manufacturers don’t offer official tools to completely uninstall graphics driver, if required. Take, for instance, according to NVIDIA, users should always uninstall driver files before updating them to newer versions. While we don’t need to always uninstall drivers before installing newer versions, at times, you might need to uninstall graphics driver to fix an issue. Just like any other Windows application, graphics drivers can be uninstalled by navigating to Programs and Features window, right-clicking on the graphics driver and then clicking Uninstall option. The problem with this standard method is that some files of the uninstalled driver will continue to remain on your PC even after uninstalling the driver. Which means that, when you uninstall a driver via Control Panel, it doesn’t get uninstalled completely. As there is no official tool out there, we need to go for third-party uninstallers to completely remove graphics drivers from our PC. Display Driver Uninstaller is a free software developed to thoroughly remove or uninstall graphics or video card drivers from your Windows 7, Windows 8, Windows 8.1 and Windows 10 in a jiffy. 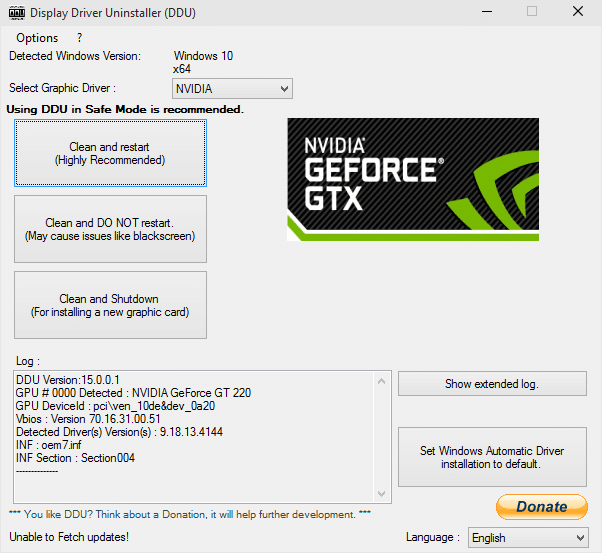 Display Driver Uninstaller is compatible with NVIDIA, AMD and Intel graphics drivers, meaning that the free utility can be used to uninstall NVIDIA, AMD, and Intel graphics drivers. The software is extremely easy-to-use. As the software is portable, there is no installation required. Upon launching the software, you’ll see the following screen asking you to reboot your computer in Safe Mode. Although the software recommends to reboot into Safe Mode to uninstall the video driver, it’s possible to uninstall display drivers without entering the Safe Mode. Click No button if you don’t want to reboot your PC into Safe Mode. 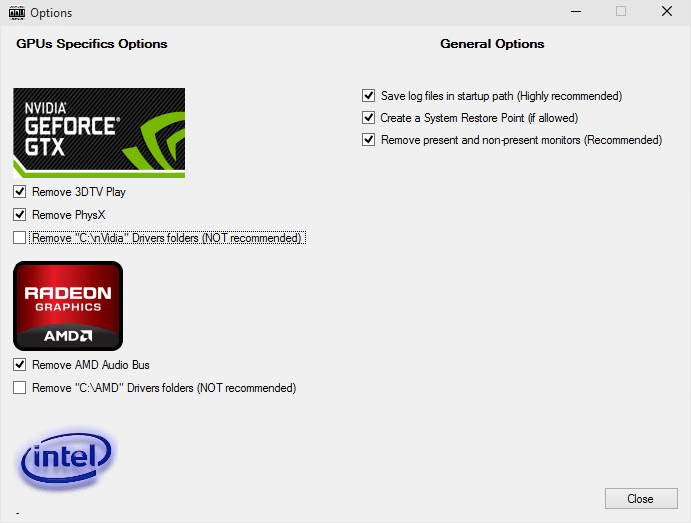 The tool automatically detects the installed graphics driver, and all you need to do is, click one of the three large buttons: Clean and restart (recommended), Clean and do not restart (not recommended), and Clean and shutdown. Note that we advise you go for the first recommended option for the best result. The tool doesn’t take much time to uninstall the installed graphics driver. Upon clicking a button, Display Driver Uninstaller first creates a system restore point (it’s the feature is enabled) so that users can easily restore the previous version, if required. Next, you’ll see the above dialog box saying that “DDU has changed a setting that prevents drivers to be downloaded automatically with Windows Update.” Simply click OK button to begin installing the driver. Once the driver is uninstalled and system is rebooted, download the latest version of the driver and install the same. If the tool is unable to completely uninstall video driver in the normal mode, which is unlikely, please reboot your PC into Safe Mode and then try again. Good luck!